This marks the first entry by our friend and Bangkok denizen, Marcela Kelley. We are excited to share her adventures in food from Thailand and around Southeast Asia. I’ve been living in Bangkok for 12 years now. When I first moved to this massive, crowded city (with its very distinct cuisine), trying to reproduce any of “our” recipes was quite a challenge. Nowadays, you can find most of the ingredients to cook nearly anything–even, say, a truly American Thanksgiving. I love to cook, and the array of food available here presents an amazing opportunity to try new ingredients, bring about not only old favorites (with a twist) but also new and exciting dishes, and create a modest, flavorful, Eastern-Western fusion that seduces the palate. For example, I was cooking chicken with mole poblano (the mole courtesy of Faustina, an amazing woman and great friend who owns a successful line of Mexican products called El Charro here in Thailand), and I thought I needed something to add color to my dish. Something to boost vibrancy and give a little kick to the dish. I went for a classic Mexican condiment, chiles en vinagre (chilies in vinegar). 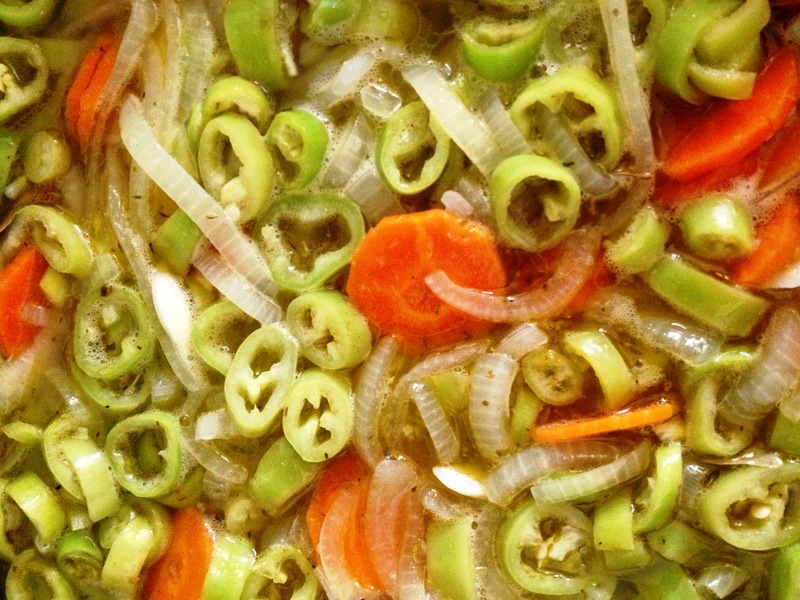 This is fairly easy to make and can be reproduced anywhere in the world—as long as you can find green chilies. Traditional Mexican recipes call for jalapeños, serranos or cuaresmeños. But here, I found a local version of Anaheim chilies, that did just wonderfully. The recipe was passed on to me by a woman I met when I first arrived in Bangkok. Now that you have your chilies, add onions, carrots, garlic, peppercorns, cumin, bay leaves, salt to taste, white vinegar and olive oil and voila. Keep the mixture in a glass jar… if you can. They will be gone in no time!